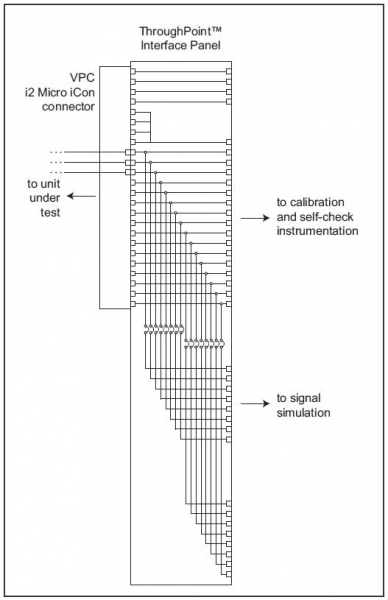 Bloomy's ThroughPoint™ Interface Panel provides a simple, yet highly-flexible connection between the unit under test and resources in a National Instruments Switch/Load/Signal Conditioning (SLSC)-based test system. The panel uses Virginia Panel Corporation’s highly-reliable, high-density i2 Micro iCon connector to route 160 UUT signals to multiple SLSC modules and other system resources. Connections within the system are made with standard D-shell connectors. Each of the UUT signals passes through a pair of standard 2mm test points which allows each signal to be disconnected, probed and patched for the ultimate in test flexibility. Unlike breakout boxes, which often get “borrowed” on a semi-permanent basis, the breakout functionality built into the system cannot be removed and is always available. For additional information download the ThroughPoint™ Interface Panel product sheet. The ThroughPoint™ panel reduces integration time through the use of standardized connectors and pinouts in SLSC system. All connections to the panel are made using off-the-shelf D-shell cables (also available from Bloomy) consisting of a mix of HD44, D9 and D25 connectors. These cables reduce the hand wiring in the system which reduces effort and errors.